Filled with elaborate French style, this tapestry "Jardin de Armide" is from a 19th century wall-paper created around 1855. It was during the reign of Louis XVI where decorative art was developed by his many court artists. In this piece we see a foreground of flowers with a subtle background hinting at a large garden grounds beyond the arches. 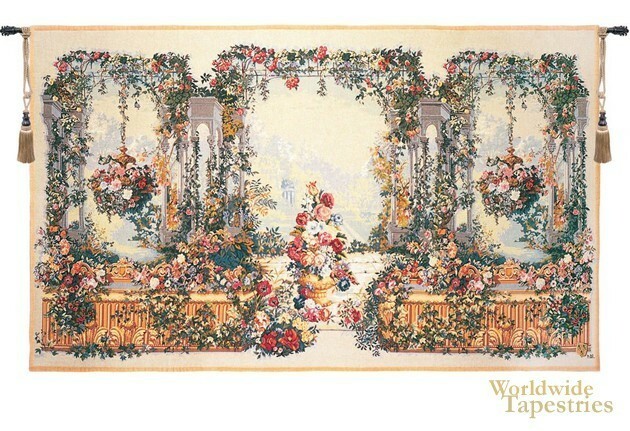 This French art tapestry "Jardin de Armide" is backed with lining and a tunnel for easy hanging. Note: rods and tassels, where pictured, are purchased separately. Dimensions: W 59" x H 37"
Dimensions: W 84" x H 50"